Gatecrashing in American weddings are rare simply because typically, weddings in the US have a much smaller cozier gathering. But they are not unheard of. However, in the US crashing in the year-end Christmas and New Year parties in large fancy hotels are more common, and by one account, it is on the rise. See www.tinyurl.com/US-gate-crashing. 1. Dress appropriately — Wear a suit to blend in. 2. Show up fashionably late. 3. Don’t coat check. This helps to leave quickly. 5. Don’t take the company gift. Sometimes there’s only enough for actual employees. 6. Don’t overindulge and avoid drawing much attention to yourself. But in Desi weddings, where the number of invitees is nearly 400 to 600 people, or even larger (if it is in India), gatecrashing is far more common. 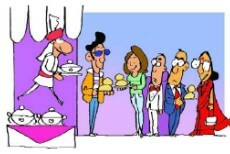 Sources in the National Institute of Technology, Kurukshetra, UP, in India said that officials at the wedding halls nearby have complained that students have been gatecrashing weddings to skip meals in the mess, which is why this directive was issued. The letter directed students to desist from indulging in such type of “uncivilised activities” which also brings a bad name to the institution. The letter warned students of disciplinary action if they are found to indulge in this behavior in future. “Disciplinary action as per the institute rules will be taken against the students if they are found indulging in such an activity,” the letter said. One thing the NIT Mess can do to prevent this behavior of its students is to improve the quality, flavor and variety of the food they serve in the students canteen!! This entry was posted on April 7, 2019, 6:24 pm and is filed under Current Issue. You can follow any responses to this entry through RSS 2.0. You can skip to the end and leave a response. Pinging is currently not allowed.